if anyone out there was missing this blog while i was on maternity leave, then you should probably cross your fingers that raechel at finding my feet doesn't do a blog post about how to jump off of bridges. because, if my past behavior is any indication, i'll be flying 9.8 newton-meters per second toward terra-firma within minutes of her post and won't be blogging much from then on. see, i'm a fan. i straight up LOVE her blog. it's got it all: jesus, photography, sewing, adorable kids, wit, design, etsy and more. i follow tons of blogs, but hers has been at the tip top in my heart for over a year now. it's one of those, i know we would be besties if i could ever meet you in real life situations. see also: tina fey (whom i might be married to if we could just get around to meeting). 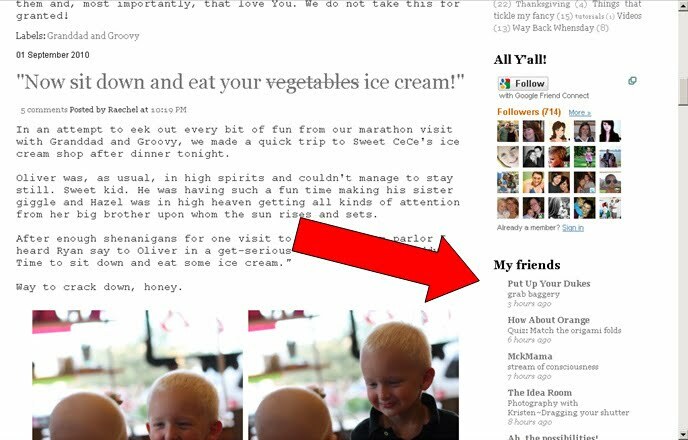 through a sewing twist of amazingatude, raechel actually found MY blog and eventually even linked to it on hers. let me tell you about that day, friends. i was just scrolling along her most recent post and i looked over under her blogroll. our blog was listed there. um, did you catch that?!?! i literally got the same feeling that i used to get at the start of every volleyball game in college: a little nauseous, a little sweaty, and about 10 million butterflies doing swooping kamikaze maneuvers in my stomach. i was also 7 months pregnant and almost shot layla out right that second. 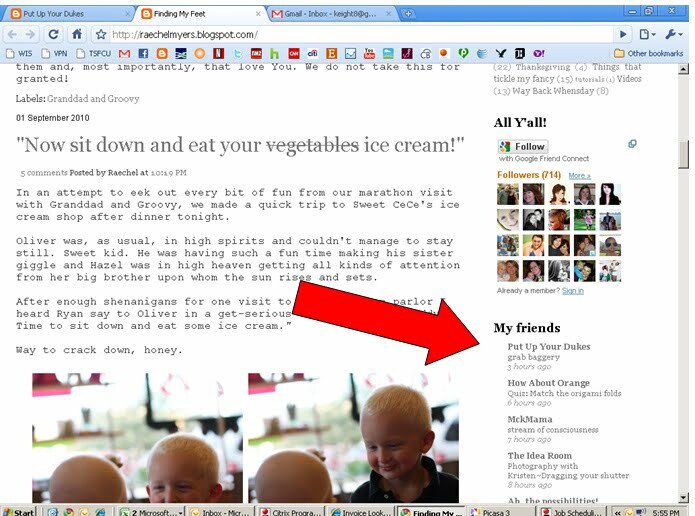 oh you know, there is our blog, on the same list as MADE, NieNie and MckMama. i took a screenshot so that i'd have proof after she has to delete me off of there because of my foul language. the arrow is mine, not raechel's. let's see, first there was her leggies tutorial. i think i waited 2 hours before heading to target and buying 12 pairs of socks to make my own. i have since made about 40 pairs (exaggeration) for layla and now sell them on etsy. then there was her rundown of favorite etsy sellers wherein she profiled the pattern shop, heidi & finn. i made it about 10 minutes from reading her post to completing the checkout on etsy for 3 of their patterns. this one worked out SO well because when i commented on her blog about buying them and then posted the results on here, we became bloggy sewing buddies (as opposed to the "real" buddies we are now. in my head at least). my latest was taking her family's christmas bleu-est of blue cheese appetizer recipe and making it for us. for dinner. it was all gone in 2 sittings by 2 people. yikes. if you have a thing for blue cheese, or sustenance of any kind, TRY THIS RECIPE. forever bleu. her pics are way better. always. i never stood a chance though: note that our nice camera is IN the picture instead of TAKING it. my photographer's eye chose cameraphone for this shot instead. this isn't one of those recipes on a blog that disappoints. for example: one night i made the crock pot steel cut oats according to a recipe on another blog that i follow. i was supposed to wake up in the morning to delicious hearty oats. instead, i got to sample the fare i would dine on if i got unplugged from the matrix. Runny McGruelYuckerson. but not raechel's recipe. she is 100% trustworthy in my experience ripping her off taking inspiration from her. so much so that i was about 2 seconds away from ripping all the carpet up in our house with my bare hands just to achieve a piece of the amazingness she and her hubby made here, but alas i was 37 weeks pregnant and fell asleep instead. as you know, i STINK at anything style-related. i can barely dress myself and not look like an escapee from american eagle's 2002 clearance mannequin depot of horrors. so having a baby girl made me even more nervous: another chick's clothes to be in charge of, SCADGE! 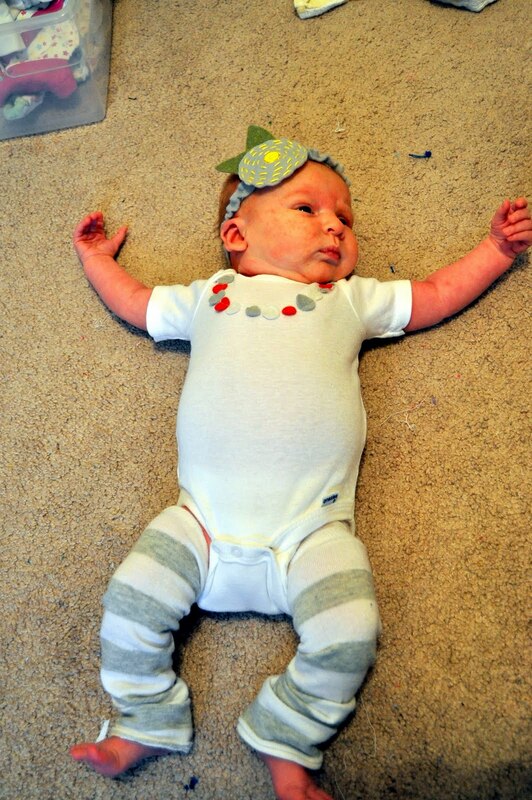 but i took myself by surprise a little when i put together this outfit for layla when she was just a few weeks old. i was thinking this might actually be sort of cute and coordinating, but not traditional or too girly. oh my gosh her poor skin was so bad back then. just as i am reaching around to pat myself on the back for this outfit it hits me: every one of these things was found, made, or stolen from raechel. leggies: idea and tutorial taken. headband: i made it as a knock off version of her cutie pie, hazel's version. necklace onesie: straight up made by and given to layla as a birthday gift from raechel (along with a gorgeous chenille burp cloth and some magical travelling pants whose inception almost made me pee mine). so of course. "my" awesome style moment wasn't mine at all. i was just channeling raechel. if you haven't taken the hint yet, i think you should go check out her blog NOW! if you do not LOL at her recent post about her son's unforseen haircut , then you and i can never be friends. but i don't need any more friends anyway now that i have raechel. okay, totally joking. nobody get uneasy. Three things: You are hilare. Sometimes reading your posts exhaust me. PLEASE TEACH ME TO BE MORE LIKE YOU. The end. Oh great. Yet another awesome blog to read that reminds me of how uncrafty and unhandy in the kitchen I am. It's ok, I'll just sit here eating pretzel M&Ms and buy everyone else's stuff on etsy. 1. I feel the same way about Raechel's blog: amazing. The total package. I am so excited for you to come up in just *gasp* two weeks! I was just telling Ryan today that I think we've piled into our future weekend about enough to accomplish in 10 weekends. Ah well, we'll do what we can. If we only accomplish a few trips to Sweet Ceces I'll be happy. Thanks for your glowing post! I don't feel stalked. But, I may have to join you in a co-stalking of Tina Fey. I heart the Lizbianator. Great. Another awesome blog to read that reminds me how uncrafty and inconvenient, I am in the kitchen. Thank you for your brilliant post. so sweet. and yes i second what you said about coming out of the shadows....great friendships can be made :).